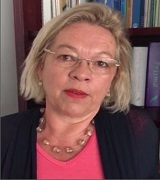 Zomeo Academic Software, a uniquely designed repertory software for homeopathy students and beginners in homeopathy. Best homeopathic literature with an easy to use interface, having 12 repertories, 150 reference books, 3250 homeopathic materia medica remedies. A reference tool to clinical investigations and clinical examinations. Zomeo Academic Version helps you to improve your grades, increase your prescribing confidence, reduce the time in solving cases and arriving at similimum. Learning from Zomeo as part of your education prepares you to become a competent homeopathic physician. 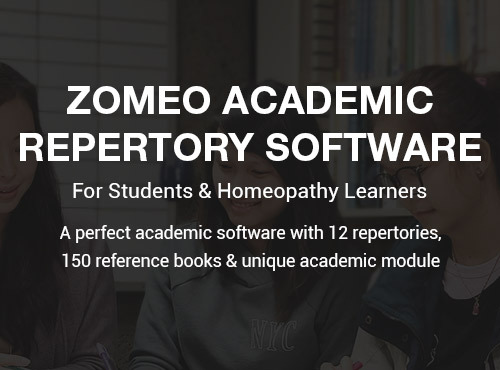 With Zomeo's Academic version, you can effortlessly train yourself with quick access to repertories, materia medica, homeopathic books and materia medica of remedies. Assist your exams with Zomeo Academic’s feature, Student Corner. Check the solutions as you practice the viva questions, question bank, clinical investigations, MCQs. Download Zomeo academic instantly and you can start finding rubrics, materia medica confirmatory symptoms within seconds. A smart guide to teach general examination, CNS, RS, GIT, Male and Female clinical examination. Create your Repertorisation sheet quickly, analyse your medicines, check rubrics covered by remedies. Add your patients, create their case data and prepare unlimited consultations. Record rubrics from repertories. Search, Quick Record, Search rubrics and remedies together. Use remedy and symptom filters to narrow down your medicines. Compare your medicines and prescribe accurately. Learn to solve challenging clinical cases with the help of 12 Repertories, 150 books, 3000+ remedies, 600+ patient instructions. Confirm your remedy using 1200 homeopathy books and 8000+ cases. 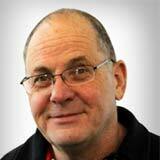 Use Potency Selector to help to find dosage and repetition. Get single window view for 3500 remedies to know keynotes, properties, materia medica, cases and families. Our Zomeo tutorial video explain it all. "I just bought their mobile app Hompath Firefly program and I wanted to tell you how pleased I am that I made this decision. It is a very good program value for money. I found it very easy to install, very easy to use. I can use it on the go in my various practice location. I have the App on my telephone so its all the time with me and the most amazing thing is it has almost all the features that my other desktop programs have. 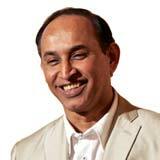 So, I am so pleased I made that decision and I wanted to let my colleagues know because it is definitely a valuable tool in ones practice and I can only highly recommend the program its value for money and also the support one gets from the Indian office is fantastic."